Are you one of those who secretly love indicators and tools? You're not alone. Most traders enjoy trying out new tools and testing different indicators. After a decade of looking at the charts, I have my own list of favourite tools and indicators that I use on a daily basis to analyse the larger market structure of the Forex & CFD markets. Today's article reviews my Top-11 and explains in detail why these tools and indicators are so dear to me. The list is set out in chronological order from least to most important (but please try to avoid scrolling to the bottom right away). The list was originally intended as a Top-10, but I was unable to eliminate the Murrey Math that ended up on the last spot primarily because I only use the indicator on higher time frames like the daily chart. The indicator plots automated support and resistance on the chart. It is a mathematical Fibonacci fractal system that divides levels into octaves, just like in music. Please view the video below for more information on the Murrey Math. Although they deserve a better place, trend lines were put here due to their irregular appearance on the chart. 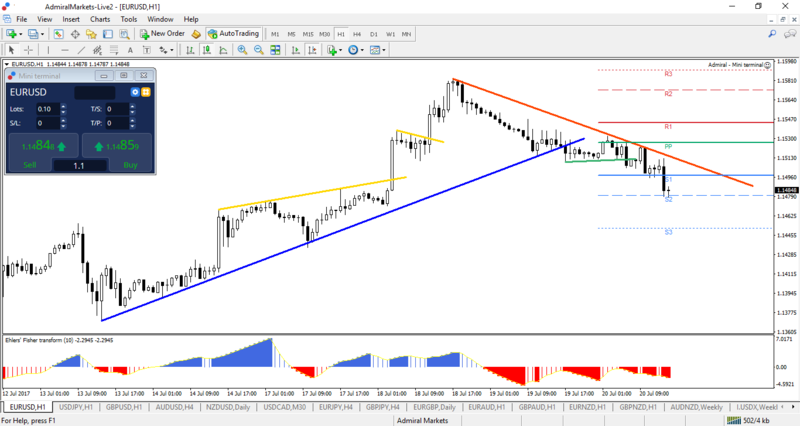 Simply said, the Forex & CFD markets do not always offers useful and tradeable trend lines. However, when they are available on the chart, trend lines and channels are a valuable tool and a powerful aid. 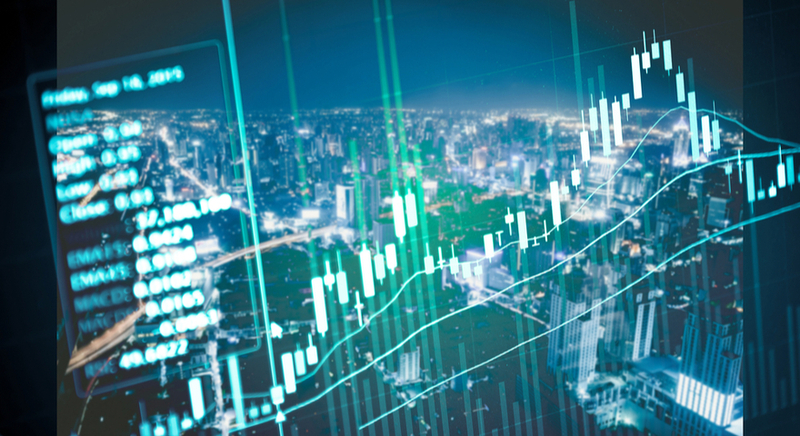 By connecting multiple price points with each other, they help traders identify trends as well as trade breakouts and bounces. Price and Fisher pullback. The Fisher goes to the opposite side of the middle (zero) line; in uptrend below the middle line and in downtrend above the middle line. The Fisher loses thickness in its bars indicating the end of correction. The chance that the pullback is completed increases as the Fisher bar turns back up (in the bullish trend) or down (in the bearish trend). Pivot Points (PP) are excellent support and resistance (S&R) levels. One of the best PP indicators is Admiral PP, which is part of the MetaTrader 4 Supreme Edition (SE) package. Account holders can trade with SE non-stop, whereas demo traders are able to test it for free for a period of one month. The R1, R2, and R3 are targets for longs. Indeed, one more oscillator has made it to Top-11. This time, the Awesome Oscillator (AO), which is quite similar to the more popular MACD. The AO is from a legendary trader Bill Williams, and I love using it for identifying the trend and spotting divergence patterns. I also use the AO for spotting and counting Elliott Wave patterns. 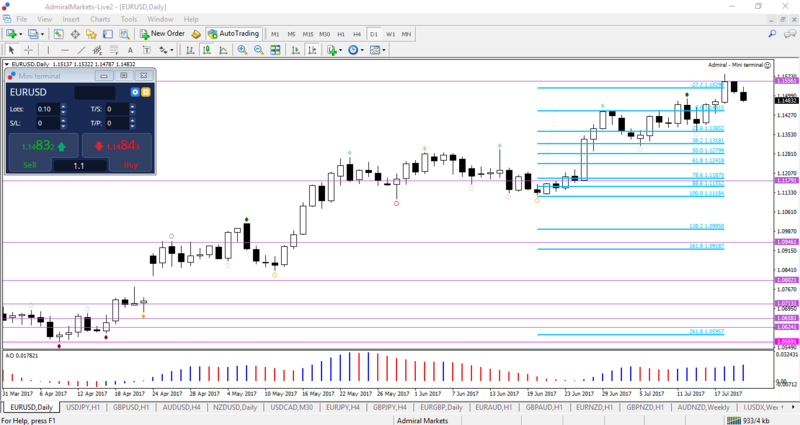 Source: EUR/USD daily chart from 31 March to 20 July 2017 showing Fibonacci retracement and targets in blue, the AO at the bottom and Wizz levels in pink and purple. The Fractal indicator is a key indicator as the market is fractal in its nature, meaning that the price and market patterns repeat with similar movements on all time frames. The Fractals not only show support and resistance levels, but also indicate when the price completes a potential swing. These swings can be either impulsive or corrective, and the Fractal helps us determine the start and end of swings. The Fibonacci retracement is a classic way of using Fibonacci levels, whereas the Wizz is a script that applies the Fibonacci sequence levels (in the number of pips) to the chart. The script adds levels based on Fibonacci pip distances from the starting point in a trend. The major benefit of the Wizz is its ability to show where the wide open spaces are when the price starts moving impulsively. It is therefore excellent for letting winners run and catching bigger sized wins. 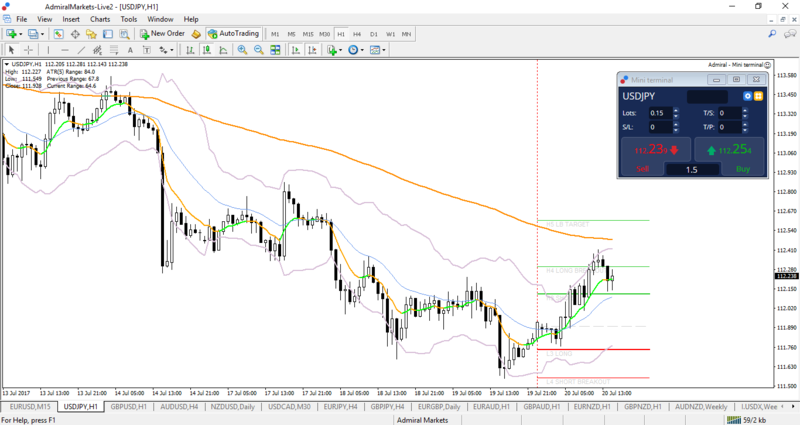 The Fibonacci retracement and target levels are my sturdy ally when tackling the Forex & CFD markets. The Fibonacci levels work best when a trend is visible and can be applied to identify potential retracement and bounce spots as well as to locate target levels. The Fibs will never lose their value and will always remain special due to their ability to show support and resistance and pinpoint both entries and targets. The Admiral Keltner band is an indicator that I apply on all time frames, including 15-minute, 1-hour, 4-hour, daily, and weekly charts. There is a clear benefit to applying volatility bands as traders are able to immediately spot the key bounce and break zones. My favourite way of using the Keltner is by waiting for breakout or reversal price action candlestick patterns to emerge at the top or bottom of the channel. Traders can find more information on trading with the Keltner in our live webinars. My trading buddy and friend Nenad Kerkez loves the Camarilla Pivot Point indicator, and I can't blame him. It is an exceptionally precise tool for identifying the trend, momentum as well as support and resistance. Source: USD/JPY 1-hour chart from 13 July to 20 July 2017 showing the Keltner Band in purple, two moving averages in orange and green, and the Camarilla in red and green. Yes, the moving average (MA) is, ultimately, my favourite indicator. Its elegance is unmatched in the world of trading, especially in the Forex market. The MA indicator provides key information about the psychology of the market as the price moves away to the mean or back to the average. I prefer to use multiple MAs that represent the short, intermediate, and long-term trend. The MA's potential to act as support or resistance. Is your favourite tool or indicator missing? Feel free to add it in the comments section below! Oh, if you are interested in some of these indicators, don't forget to check out MetaTrader 4 Supreme Edition that offers the Keltner indicator and Admiral Pivot Points as a special add-on along with 60 other extra features! Connect with Chris Svorcik on Facebook for more Forex and CFD information!